How to Replace Toilet Handles with $7 and 7 minutes! 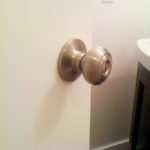 Our half bath is just awaiting a few finishing touches before I’m ready to share it with you. 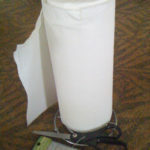 I wanted to break some of it up into some simple tutorials for those also interested in DIY projects. 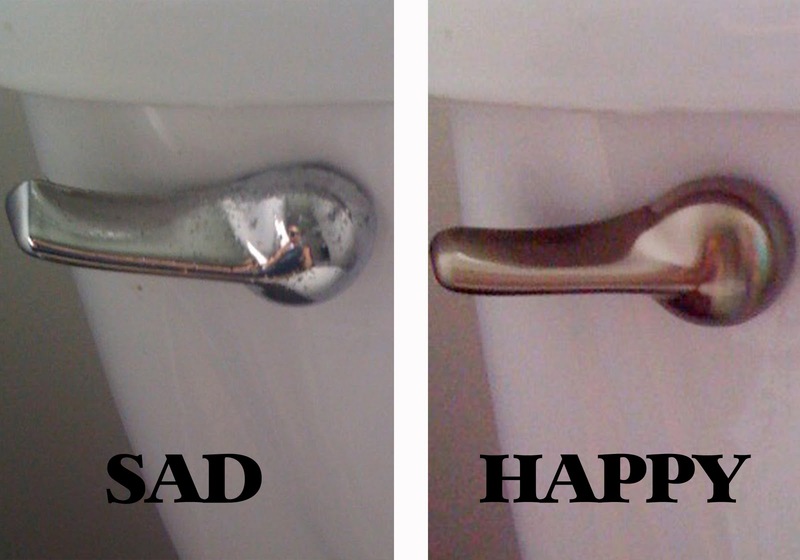 The flusher to the crapper, to be more precise. Yup. Our sad little guy had the ugliest flusher I ever did see. All chipping and flaking. Like the poor thing was in the beginning stages of chrome leprosy. 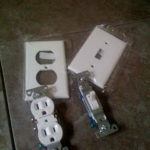 At first, I was just going to ignore it, and I didn’t think about it or stress about it for the three weeks tha our bathroom was gutted (we only have an hour here or there when my husband is available to help tackle the big projects like tiling and switching our overhead lighting to two sconces). 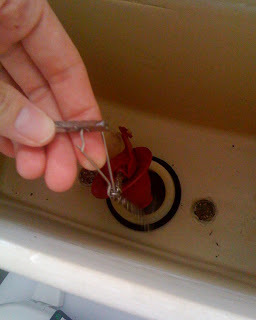 But then we put it back together. My painting and new trim and new sink and new tile were all SO pretty. 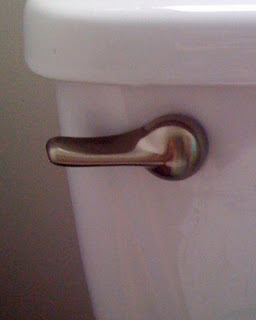 I have to admit I became ashamed of the sad little flusher. So he’s gone to flusher heaven. Watch out, he may be reincarnated into one of my future chandelier projects or something…! 😉 Just kidding. But ya just never know ’round these parts. I went to our friendly City Mill and found this kit for less than $7! Sweet. Step 1) Remove the tank lid. 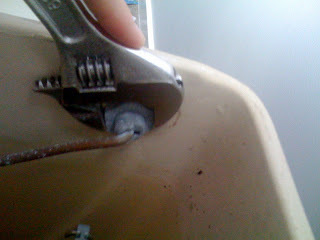 Ours had been drained since we removed the entire thing while we tiled and painted. 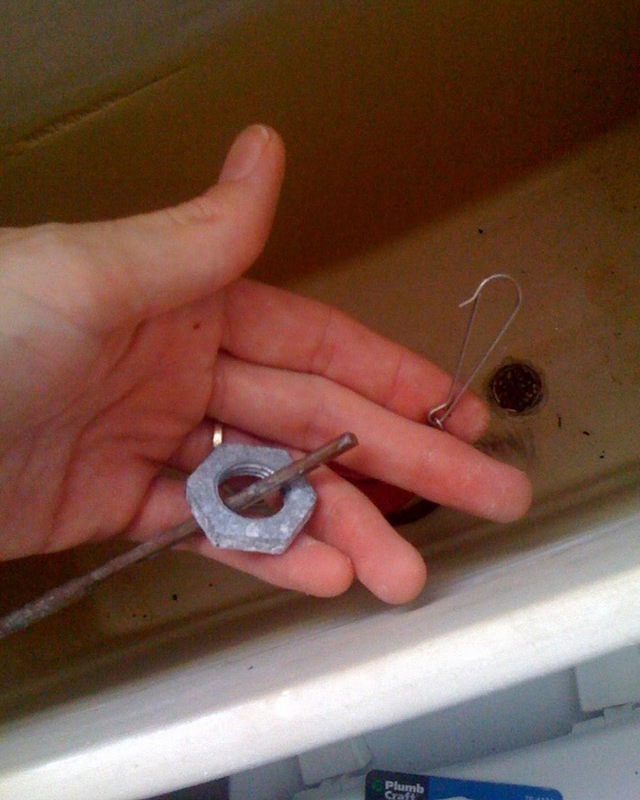 Yours should have water in it, so you may want wear some rubber gloves and have an assistant hold the chain or be prepared to fish it out when you’re ready to attach it to your new lever. 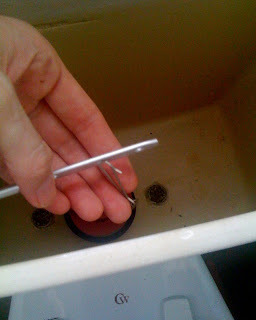 Step 2) Find the chain hooked to the end of the lever that sticks out of the flusher and unhook it. 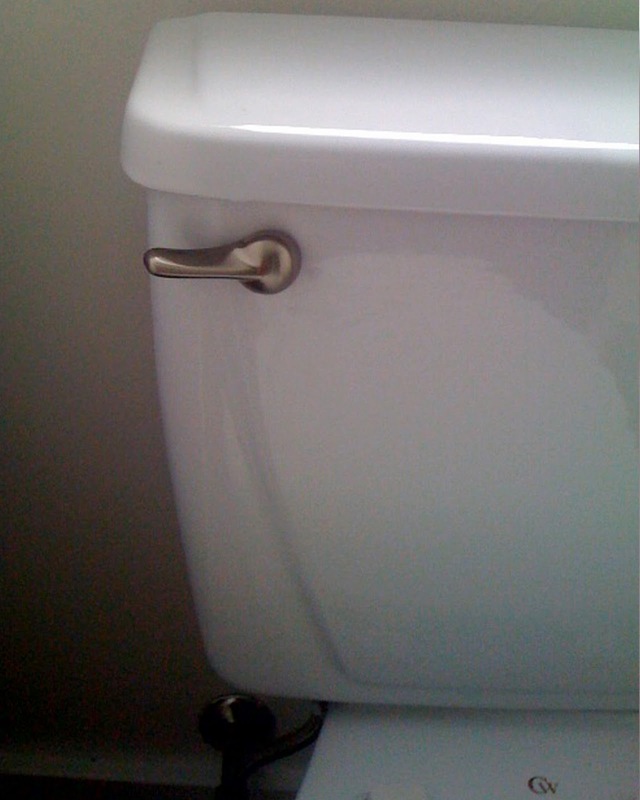 Don’t worry if you lift up, and that little plug opens, and the toilet water starts rushing out! 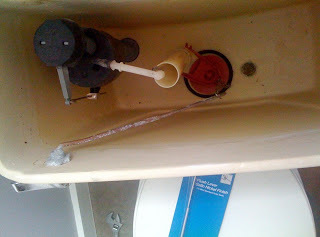 This is called “flushing the toilet”. You do it multiple times every day. Amazing, huh? 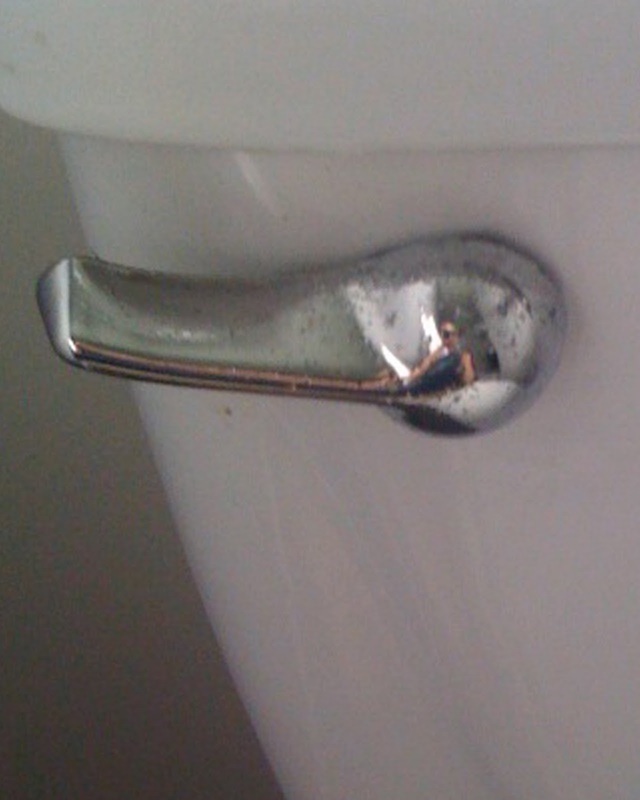 Have you ever watched the toilet flush from the inside? Congrats! There’s a first for everything!! 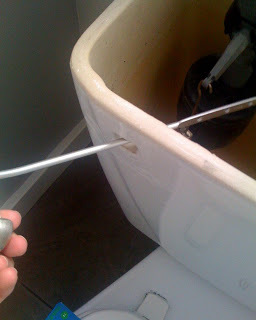 Step 5) Slip the nut all the way off and then remove the flusher handle and the attached lever all the way out the front. 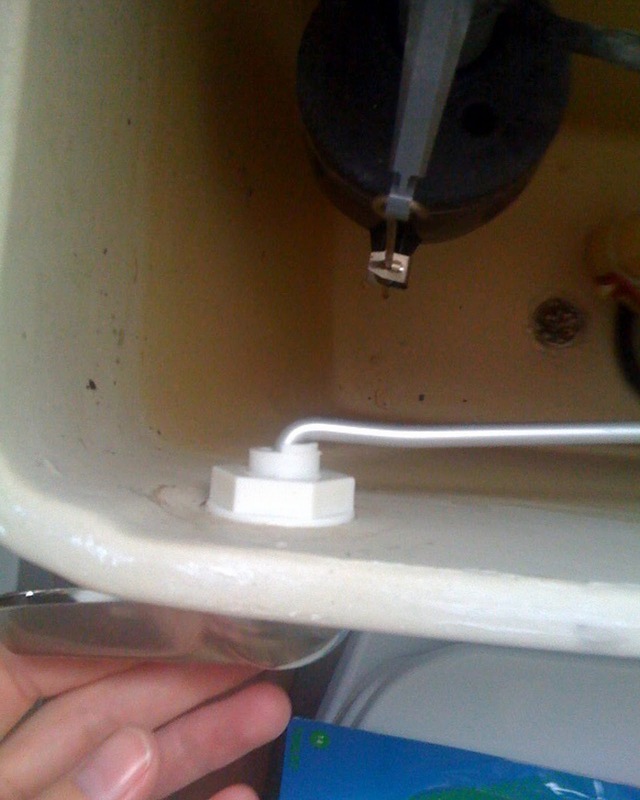 Step 6) Put the new lever/handle/flusher attachment in. Step 7) Attach the new nut that came with your kit (mine was plastic) and rehook the chain! Much better. My toilet has aloha. Does yours? Paper Towel Pom Poms Tutorial – Easy and Cheap! 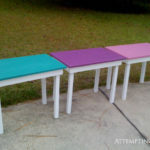 So cute, what an easy idea and it has such impact! Excellent tutorial,not daunting at all. What a great improvement! Looks way better. I have a handle or two that need to be replaced. One has a tiny crack in it. I don't even want to imagine how one of my boys managed that! I'll have to give this a try. Hi, I'm visiting via Nifty Thrifty Tuesday. Fun post. We've been through this a few times in our house. It must be something about our toilet, but the plastic handles we got at Lowes kept cracking, so we went to a plumbing supply house and got a metal one. Looks great. Thanks for the how-to. stopping by from CREATIVE SHARE! your like Mrs. Fix it. the toilet looks great. Very cool and so easy. It is one of those things that sounds really hard until you actually do it. Thank you for sharing. 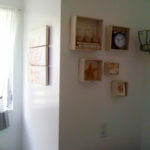 A great fixer upper post! I feel so empowered now! Thanks for showing us girls how to conquer this ! What a great metamorphosis! Not "crappy" at all. 🙂 Well done. I am having a hilarious Linky party with prizes this Wednesday. 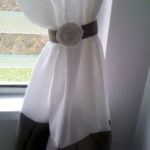 Details are on my blog today. I hope you'll join in on the fun. 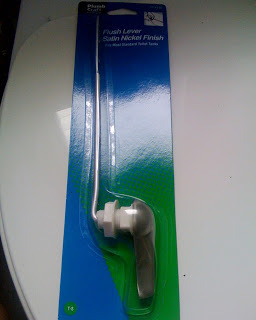 I never dreamed about replacing the flusher as part of a potty redo! Mine needs changed and I am putting this on my list!! Thanks!! I just had to do the same thing and everyone was saying "just have the apartment company do it" but I wanted to do it myself and feel proud :). And I did!